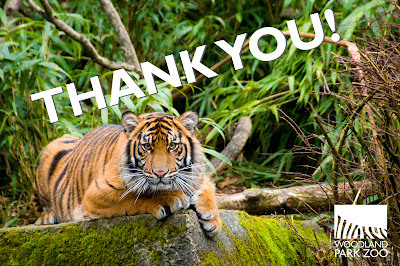 Woodland Park Zoo Blog: Give Ten for Tigers: You did it! You’ve shown your stripes and caused an uproar for tigers through our Give Ten for Tigers campaign. Thanks to you, we’ve gone over goal and raised an incredible $115,000 well before the deadline and we got the $100,000 match!!! We now have enough to start construction on the first phase of the incredible new tropical forest exhibit for tigers, sloth bears and otters! We can’t thank you enough for giving to the cause and spreading the word to your friends. Every dollar and every share helped get us here. YOU got us to this first critical milestone! Construction on this first phase, which includes the home of the new Asian small-clawed otters, will begin the day after Labor Day and open May 2013. In the meantime, everything that’s come in over the $100,000 goal, and every dollar raised from now on, will help build the second and final phase of the new home for our tigers and sloth bears, which will open in 2014. Thanks so much for giving ten for tigers!